Talk about left brain, right brain! Paivi Eerola is one of those people who can do both. From a practical career in IT, Paivi finally left that safety net to become a full time artist, and there’s been no looking back. her art business and so much more!! We hope you enjoy this interview with Paivi as much as we did. She’s a wealth of information, knowledge and experience. Devani Alderson: Hello, and welcome to another episode of the iCreateDaily podcast, a movement for creators serious about their art. I’m Devani Alderson. LeAura Alderson: And I’m LeAura Alderson. Our guest today is all the way from Finland. It is Paivi Eerola. Paivi is a former IT, information technologist expert and professor, turned full-time artist. Paivi is a prolific artist with at least five courses teaching students around the world to learn to use both sides of their brain, logic and feeling, through art. Welcome, Paivi! Paivi Eerola: Thank you. Thank you. Thanks for having me. Not a professor, though. Not so high, but I have a long career in IT business, yeah. LeAura Alderson: Okay, yes. I love the picture on your website, under your “About.” You’re teaching in the dry, static environment of IT, or whatever classroom environment you’re in, and then you’re pointing to where you go in the future. Tell us about that journey. How did you go from being in the IT and the logic side of it, and migrate into becoming a full-time artist? Just before that, I had also started blogging, and sharing all my creative projects. First they were just knitting, but then I soon moved to paper crafts, and then to art. Then I took a jump that I thought that it was a giant jump, to leave my day job for a couple of years and study as an industrial designer. That was a brilliant time, and I had more time for blogging too, and I had all kinds of creative projects. After that, I went back to … Not the same job. I started working as a service designer, and I worked with websites, and designed websites and services. Paivi Eerola: During that, the creativity called me again, and I continued blogging. I think that’s the main story about me, that I have been blogging more than 10 years. Paivi Eerola: Yeah. Blogging about art approximately nine years or something. Paivi Eerola: I was a very beginner in art, because there’s a funny thing that even if I created a lot of art as a child, and as a teenager, when I had about 10 years or so when I didn’t create anything by drawing or painting, I kind of lost those skills, and I’ve kind of lost that connection. Paivi Eerola: But it didn’t prevent me starting sharing stuff that I had done, because I always enjoyed sharing through internet, and then I sort of realized that I have some kind of audience, and that was surprising, because first I thought that it’s kind of personal diary, a personal blog. Then in 2010 … I have to check. Yeah. 2010 was a really important thing that somebody said to me, or I read about somewhere. I read somewhere that I should establish an email list. That was really scary, and actually it felt very uncomfortable thing to do, but when I had studied engineering, I had done a lot of uncomfortable stuff, so I thought that somebody else knows this better than me. That I will establish this list, and if there’s one or two subscribers, that’s okay. I was surprised that I was getting those subscribers, and at first it felt really awkward to send those emails, but then when the years went by, I thought about that more and more. That I have kind of potential there in my email list. Then in 2013, so four years ago, I made a plan that I’m going to grow my email list to a certain number within nine months, and then I’m going to leave my day job. Yeah. When I think that, it’s actually quite ridiculous, that the jump from the engineer to designer felt so big back then, because the jump was much bigger when I started supporting myself. Paivi Eerola: That was my plan, and I did exactly that. I think that regular blogging that I had done for so many years, that’s what really had taken me here. It’s not only about that, that I would gather an audience like that. It’s also that my readers helped me. Paivi Eerola: That in a way, that when I posted something, when I experimented something and posted something, and then there were posts that had no comments at all, and then there were posts that had tens of comments. That way, I kind of found my direction. That what’s there in me that fascinates others and benefits others. Paivi Eerola: Yeah. That’s the main thing, I think. LeAura Alderson: Yeah. There’s so many great points about your story. I think the one that really stands out for me is, don’t let being uncomfortable stop you. LeAura Alderson: Especially stop you from learning and growing. Take the leap into the unknown, but be prepared when you do. You didn’t just rashly leave the corporate world and the security without a safety net. You had already done lots of building of a separate, secondary safety net of your own before you finally took that leap. LeAura Alderson: Well, that’s a good point. I tend to think of it as distinguishing the voice of fear, the negative voice, from the voice of vision, you know? Paivi Eerola: Yeah. Yeah, exactly. Yeah. LeAura Alderson: Yeah. I definitely don’t listen to that voice of fear. Devani Alderson: Could you talk a little bit about what you’re currently doing? 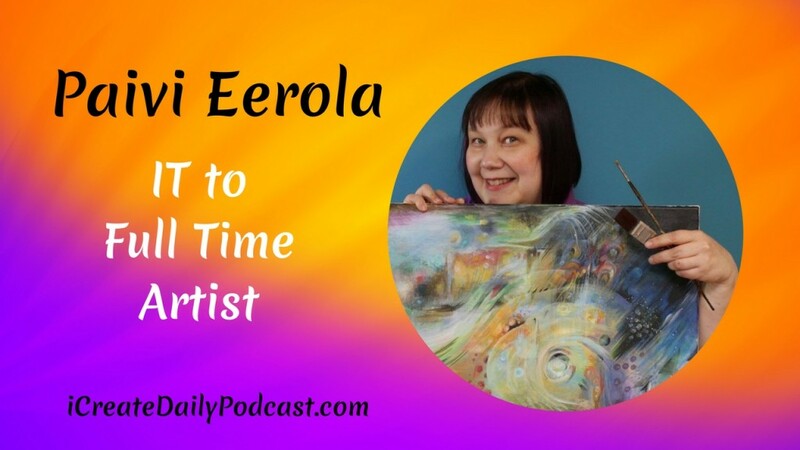 You dove into the art career full-time in 2013, so what are some of the things you’re doing now that take up most of your time in running your business and doing the art part? Paivi Eerola: Yeah. It was actually three years ago, 2014. Paivi Eerola: When my nine-month plan came through. Paivi Eerola: My idea was that I’m going to build self-study classes, because I can’t speak English. I can write English, but I can’t speak. LeAura Alderson: Oh, you’re speaking fine. Paivi Eerola: Back then, I thought that if I produce these self-study classes, they will be my thing. I didn’t think so much about creating fine art or such. I just thought about these classes, because I have been teaching all my life, and teaching has always been an important part of me. I kind of saw myself continuing the teaching career, but in a totally different field. Paivi Eerola: But then, I soon realized that my strength is somewhere in different things. Even if I enjoy writing and I enjoy literary work, actually the thing why people have been reading my blog was to create some kind of friendship with me, and if I wanted to make that friendship stronger, then I need to come out and start speaking, and start connecting in reality, and in a real way. Paivi Eerola: Very soon, it felt that I want to have classes that have more interaction, and where I can really guide people how to create art. Not only the technical stuff, but also how to connect with imagination as well. I feel that this kind of interaction is essential in growing as an artist, and it has also brought much more meaning to my daily life, because I’m working alone at home and when I’m connecting, I don’t feel so alone. Paivi Eerola: That’s important. I could say a few things about what I actually do. One of my specialties is to teach people to draw freely, draw from the imagination. That’s where I’ve developed a lot of methods, so that’s where my engineering background steps in. Every time my artistic side does something, my engineering side asks, “Why did you do that? Why did you do this? Why did you do that? Is there some kind of system behind all that?” I’ve developed ways to draw from imagination and to get looser, because I think that most people who pursue art and who start practicing art, they soon realize that in art, it’s really important to liberate yourself, to let go and loosen up, and get in touch with your imagination. Because when we create art, we want to create something unique, and that imagination steps in then. Another thing that I’m really enthusiastic about, that I’ve also developed a six-step method, is my coaching program called The Exploring Artist, where I guide emerging artists, find their true passion. What’s their true passion in art, and also in design? Because for many, when they create, they’re actually more into design than into creating art. They want to create illustrations, or they want to create patterns, or more design stuff, even if they don’t at first realize that. I guide people to find their artistic voice, and also put words into that, and that’s kind of funny, if you think that when I started I thought that I’m going to build self-study classes, only because my English is so bad. Now, I’m actually helping people to find words for their visuals in English. Devani Alderson: But you’re doing great, though, and it’s such a cool story. I’m sure it inspires a lot of your students to be like, okay, well you came this far with your background in engineering, which is a whole other side of your brain that you’re using, and now you’re teaching people how to discover their artistic voice, and that’s incredible. Paivi Eerola: Yeah. You know, there are jokes about Finnish computer engineers, how stiff they are. I know what they’ve learned from being in the same school. LeAura Alderson: Well I mean, it’s a wonderful balancing. Especially I’m fascinated about a couple of things. One is, many people are disconnected from their passion, so that’s your course helping them to connect with that is really important and significant. I’m sure you must see some beautiful examples of people’s creativity coming alive more fully, once you discover their passion and vice-versa. Paivi Eerola: Yeah. Because I focus on visual artists and visual people, often, what’s happened to me too, is that visuals are sometimes there that you actually get the connection with the visuals, but then when you start talking about your work, it’s extremely difficult, and almost embarrassing. I think that that prevents many visual artists who are very skillful, that prevents them from sharing, because it’s so personal also, and they are so deeply connected with that passion through the visuals that it feels so bad to reveal all that. Paivi Eerola: And then sometimes I also have students or participants that have very high understanding of aesthetics, but they lack the technical skills in how to use their hands to connect with that higher level understanding, and that’s also where I help people. Paivi Eerola: How to get all the little tricks that visuals have to express what you want to express. LeAura Alderson: Helping them develop the mind-brain connection, so the mind, brain, to the fingers and the hands. Devani Alderson: What an amazing balance of technical and creative. We talk about that a lot, because both LeAura and I, we’re generalists. We know a little bit about this and that, but we excel in the creative side. Having that balance for artists, and especially a lot of artists where when you’re starting out and you know what you want to convey, and you might have a great sense of style, like that Ira Glass video. I don’t know if you’ve seen it, but he talks about how you know that you have the style, and you know something’s there, but it’s just not great yet. It seems like you have that perfect balance to help people bridge the gap of practical technical skill, and how to hone their creativity so that they can actually get their message across. Paivi Eerola: That’s also where when you share your work, that helps, because then you really get the response to, and you put more effort into your work. LeAura Alderson: Yes. We’ve spoken with other artists and have this awareness of how there’s a sensitivity and fear of putting your work into the world, lest it be judged, or lest people not like it. Yet we also have to, as artistic creatives, develop a little bit of a thick skin. It’s like a fine balance. Listening to our critics, especially those who are our fans, and listening to their feedback so that we can grow and improve, while simultaneously doing work that we love to do and value even in spite of the critics, right? That’s a fine line. One of our mutual friends, Ava Nikunen, who told us about you in the first place, she’s a fantasy artist of fantastic caliber, and I think one of the ways that she tells about her art and what it means to her is through story. She creates stories about her pieces of art, and she’s kind of building an entire world. For those who have a shyness around telling their personal emotions about it, it would seem like writing stories or even captions about their art could be really helpful. LeAura Alderson: Now, one of the people in our audience, when we told them we were interviewing you today, wanted us to ask you, what do you call your style of art, and how did you arrive at that, beyond what you’ve shared about your journey so far? Paivi Eerola: Yeah. Yeah. My style of art is … I create kind of romantic art. I create kind of romantic scenes from the other world, I would say. Paivi Eerola: I also like to combine abstract and realistic together, but I think that the best definition, which doesn’t come in the field of art, but from my personal stories, that when I started sharing my work, and even already when I started sharing my knitting, or where I started blogging, Finnish people wasn’t so keen on my work. Because Finnish, they like very simple stuff. My work is very rich and full of stuff. Paivi Eerola: I think that’s one reason I found my audience mostly in the USA, that there were enough people who loved colors, and the richness. I think that the best word to describe my style, it’s richness of colors and shapes. Sometimes an overwhelming richness, even, and also most of my work is connected with art history in some way. I get a lot of inspiration from the history of art and design. LeAura Alderson: Yeah. I noticed a post on your Facebook timeline talking about the Van Gogh movie that’s coming out, or is already out shortly, and you did your own wonderful rendition of the self-portrait concept. Paivi Eerola: Yeah. Yeah. That’s actually made without any reference photos, and I often create art like that. Paivi Eerola: That I don’t use any reference photos, even if I create quite realistic things. Then often, when I use reference photos, I might create a lot first without those, and then just bring some details with reference photos. LeAura Alderson: When you are working in that way, and creating without reference photos, are you seeing the visual in your mind before it goes on canvas? Paivi Eerola: I’m actually very much opposed to that. Of course, visual people see visual images, but I don’t overestimate them, overvalue them. I think that many have this problem that they overvalue the visuals they see in their dreams, or the visuals they see somewhere when they walk in nature or something like that. When you create intuitively, it’s more about seeing what appears on the paper than trying to compare the image in your mind with the image that you’re producing. I have kind of explained that to myself so that my creativity, it is much more clever than what I intentionally think. That my creativity takes information and all that from several sources, and mixes them together. I think that’s the nature of creativity, to pick all kinds of associations and then mix them together. I think that it prevents and locks that creativity if you try to copy something very, very into detail. I’ve also tested that. The images in my mind, how accurate are they? Are they like reference images that I can use? And if I see that image, for example, a beautiful seascape or something, and then I start asking that, “What color is that wave?” And how defined it is, and, “What’s the shape of it?” I can’t actually tell. If I can’t tell, how can I really copy it? I don’t think that’s a successful way to create art, to try to copy one single image of mind. I think that you should change the image frequently while you’re creating, and try to see what appears on the canvas, and accept what appears there. Devani Alderson: Yeah. I was scrolling through your Instagram, and you were talking about the creativity and mixing the styles, and what happens, and what intuitively comes out to the canvas, and while scrolling through your images, you have a huge array of style, and you’re very prolific with your creation. Do you have daily habits surrounding that? Do you have rituals that allow your intuition to blossom onto the canvas? What is the process for that? Paivi Eerola: The fact that I have so many styles, so I can stretch my style to so many directions, is that I didn’t actually think that I’m a good teacher if I can’t do that. I think that when people come to create, and they ask for advice, I try to give the advice that fits them, that what they want to create now. I think that teaching is not about teaching my style for other people. It’s about helping them to find things that inspire them. Paivi Eerola: Often, when people say that they want to find their style, it’s often a mix of many, many styles and many different sources of inspiration. LeAura Alderson: Like us… [and how we’re all made up of a blend of many things]. Paivi Eerola: The main problem with many, that they think that they have to fixate in something, that they have to label and fixate in something, when actually it’s better to start combining all kinds of inspiration and bring your uniqueness up in that way. That’s why I always try to look for different styles, and of course because I’m a designer, we are trained for noticing all kinds of little things that make the style. That’s also one thing. About the regular practices, of course I spend most of my days creating something, but often it’s something like I’m editing videos or something. It’s not painting, what I create every day. But I think that the most important ritual is that I take my dogs for a walk twice a day. Paivi Eerola: That’s my time to spend in my thoughts, especially in the mornings, when I plan the day. I think that walking or moving forward helps thoughts to move forward, too. Paivi Eerola: Yeah. I think that’s my main routine. Paivi Eerola: During that, I plan the program of the day. Of course, I have longer, longtime plans and such, and I have weekly plans, but for that day, I plan that, and I kind of imagine doing all that work, so that when I get back home, I already know what button to press or what color to take out. I already know what I’m doing. I think that’s a very important part of my creativity and productivity, especially. LeAura Alderson: Yeah. That’s an excellent point. We’re all for that. We have dogs. We do the same thing, and it’s one of the best ways to get unstuck. If someone is stuck, and going through feeling uninspired, or even having whatever trouble in their life, it changes their physiology to go for a walk and breathe in nature. Although, I can not imagine walking every day twice a day in your wintertime. Paivi Eerola: Yeah. You know, just today we had the first snow. It’s a bit sad day, but [crosstalk 00:29:13]. LeAura Alderson: Yeah. Today. October. This is October 26, 2017, so you had your first snow. Is that normal? About the normal time for your first snow? Paivi Eerola: I think it’s a bit early in the south where I live. I live very near Helsinki, the capital city, so I think it’s a bit early, but about this time, yeah. LeAura Alderson: Okay. Before we move on to learn more about your art business and the business of art, one of the descriptors that came to mind for me when you were describing your style of art is a mystical romance of color. Paivi Eerola: Yeah. That’s well-put, yeah. LeAura Alderson: It has, like you said, it’s a romance, but then there’s a mystical, ethereal quality to it as well. To me, that you had the vision beyond the physical vision, into the other realms. It seems somewhat like that otherworldly, a bit. Paivi Eerola: Yeah. Yeah. Thank you. LeAura Alderson: You’re welcome. [inaudible 00:30:12]. Devani Alderson: Yeah, so switching over to the art business side of your art business, what are some of the things that you do every day, or what are the two or three things that you do in your business to make it successful for other people listening who want to do this? LeAura Alderson: Yeah, so you have … Sorry. Let me interject for just a … I guess the one question, too, is separating for you, because you have paintings that you sell, and then you have the courses. Just talking about paintings for now, for those who don’t have courses, what are the things that are most profitable and productive for you in your business of art, selling art? And the courses will come later. Paivi Eerola: I think it’s the same thing for both, actually. That the core thing today is still blogging and sending my weekly emails. That’s the main thing for both of my business, is to create relationships that way. I send weekly emails, and I also blog weekly, once a week, and I take this extremely seriously. My blog posts are quite comprehensive, also quite visual, and I also always have a theme for them. Sometimes, my students also help me to have more visuals there. I think that’s the core thing. I don’t have any daily routine for business in that way, other than walking the dogs, which serves that, but my selling and marketing is based on weekly intervals. I have certain processes that I do weekly. I post several times in social media during the week, but my weekly blogging is still the most essential thing. Then of course I participate, the interviews like this, and sometimes I have local classes so that I can see that my … That I tell that I can see the reactions in people’s faces, because I don’t always see that when working online. I do have live sessions and classes, but there’s no so much live when posting social media and such, so that you can see the reactions. Paivi Eerola: But weekly blogging is the main thing for me. LeAura Alderson: Weekly blogging, and then you share your blog articles and more in the emails. In order for making money from your art itself, are people on your email list buying your art? Do they buy originals? Do they buy prints? Are you selling cards and other things? Paivi Eerola: Yeah. I do sell some cards, and some prints, but mainly originals. LeAura Alderson: Originals is the number one seller for you, and therefore the most profitable? Paivi Eerola: Yeah. Yeah. Absolutely. Yeah. LeAura Alderson: When you sell that, but you’ve already captured the original digitally, so you still are able to reproduce other things from that original that’s otherwise gone forever, right? Paivi Eerola: Yeah. Yeah. Of course. Yeah. Of course. I use all that in my marketing and such. When I say that when selling art, the originals are the main thing, it’s actually that I’m planning to get more into printing, and I’m also planning to create a book about my pieces, because I’ve got quite a lot of requests for that. This year, a big thing for me has been to develop this coaching program, so I’ve had to put that aside for a while. LeAura Alderson: Yeah. Tell us more about … Because you have five on your site, right? Five different coaching programs, or courses? Paivi Eerola: I have several courses. I think I have more than 10 courses. Paivi Eerola: And also, some workshops that I run regularly, but that are not available as a self-study, so I think I’ve created tens of courses. Paivi Eerola: Yes. My coaching program is not a self-study one, but involves live sessions and such, so I run that regularly, so the next time will be in the beginning of next year. LeAura Alderson: Okay, so in January. Paivi Eerola: I’ve just ended the group, and then the next time will be in 2018. LeAura Alderson: And tell us a little bit more … Excuse me. Tell us a little bit more about that. How long is that coaching course, and what does it involve? Paivi Eerola: Yeah. That’s 12 weeks. That’s a six-step program in 12 weeks, so that’s two week for each step, and we start from a passion, and then we end for courage and sharing, and all of that. Paivi Eerola: I’ve also included a section for skills, and that’s not only about skills about creating art, because I’ve seen that for many artists, they neglect the skill things so that they think that they have to just create better and better art. If they just become better and better in creating art, they will be more popular, more noticeable, that somebody will dig them out of their homes, and then the success will come. But I think that being an artist is also about understanding the wide skillset that you have to create, that it’s also about connecting with people. For example, with me it’s making videos, and editing videos, and understanding a kind of drama. I don’t know how to say it, but the sense of drama when creating the videos so that you can watch that video without getting too bored. Paivi Eerola: That’s an essential skill. That’s not only about that I create some modern paintings in the videos. It’s actually vice-versa, that I have to include a wide range of kind of skill levels into one class, so that those who are more advanced in imaginative level can learn more about technical skills and vice-versa. I think there’s a lot of skills that we need when we support ourselves, and that’s also something that I’ve included in the coaching program. To make, it kind of analyzes what kind of skills you actually need, and start building those in a safe environment, in that group. That’s quite close-knit group when we are there for 12 weeks and we have four live sessions or so, so that’s also something that’s good, that you have a safe environment to start building that wide skillset. LeAura Alderson: You’re saying that you have four live sessions, so that’s online, through a medium like this? LeAura Alderson: Are the students also visible, or is it just you? Paivi Eerola: Yeah. Yeah. I have hot seats for all the participants. LeAura Alderson: About how many students do you typically enroll in that 12-week? Paivi Eerola: Typically 15. Yeah, but I give personal advice for everyone during the live session, and also in the discussion group, that I have Facebook. The discussion group in Facebook. I give personalized advice for everybody. Devani Alderson: That’s an incredible workload. Not only are you doing your weekly blog post, your weekly newsletter, and it’s not just like, “Hey, I’m going to toss a blog up online.” You have in-depth informational blog content, which takes a lot of time to produce, and then you have 15 students that throughout various stages of the year, that you’re coaching, and helping, and doing sessions with. Is this all you? Do you have help? Do you have as-needed help? How does that work for you? Paivi Eerola: Yeah. Most of the things is me, if you think about it as somebody who performs, in that way. But then of course my husband helps me in bookkeeping, and also in some practical stuff, like if I need a new microphone or something, I ask him to study, “What’s the best one?” That kind of background stuff, my husband’s brilliant with that. Paivi Eerola: But I think that it’s not only that, but I also have a community that supports me in mental way, that I get mental support from. I belong to Tara Gentile’s CoCommercial Community. I belong to Leaders Circle there, and that’s a sample of small business owners, mostly digital business owners, which is also important to me, that I connect with other digital business owners, because I think that it’s so different to sell services online than to sell physical items. Paivi Eerola: That community, I’m not always really, really talky or active, but it’s really important part of me encouraging myself and getting encouragement if I get bad days, and also to raise the bar in my business. I have noticed that if I only connect with artists, then the business side of stuff easily gets neglected. Paivi Eerola: I easily forget that I’m also a business owner. Paivi Eerola: Yeah. I think that we have to also find the leader in us when we are supporting ourselves, that that leadership actually keeps me doing all that. That’s where I’ve got help. I’ve also gone through Tara’s coaching program a few years ago, and during that time, I really understood that artists need leadership too, and that’s also an integral part of my coaching program, for people to find a leader in them so that it’s not only the specialist that’s creating art. It’s also a leader that’s encouraging and supporting all that. Devani Alderson: I love that. LeAura Alderson: Yeah. That’s fantastic, and it’s so important. We’re big on that, and the concept is, no matter how good you are, whether or not you think you have arrived at the place where you want to be with your art, and you posted something about this recently on your timeline, in fact. The concept of, with each painting you’re discovering where your art is and what your art is. It’s a process. It’s a journey. That’s why it’s so important to continue our own education, so even while you’re teaching others, then you are still looking to others to be taught, and to learn from, and like you said, to connect with. For us, we’re more on … For me in particular, my creativity really is more business. Creating the business, and writing. That’s why the iCreateDaily includes entrepreneurs, because building a business is creating something from nothing. It’s like building a painting. If we create a painting but have no structure for sharing it with the world, then it’s wonderful for us, but it doesn’t live out its potential. Paivi Eerola: Definitely. I love what you’re talking about. Yeah. Definitely. When I left my day job and I started working for myself, I realized that I’m a really bad boss. I’m kind of manager that I try to manage everything. I had these huge lists that I had to do, and the longer the lists got, the less I got done. Then I thought that, “Oh, no. Things are not better at all, even if I’ve left my day job. What should I do?” I know I’m a really, really productive person if I get the motivation to do it, and I didn’t realize, what’s the lacking motivation here? Because I feel that I’m really motivated, but then this boss always appeared and showed all these lists and how far behind I am, and then one day I told myself that, “If you know what you want me to do, then do it yourself. I’m going out with my dogs.” I realized that that’s actually exactly the same situation I had sometimes had in my day jobs, that when somebody tells you so accurately what you should do, it’s actually really discouraging. Then during that coaching program with Tara, I realized that I have to persuade myself. I have to talk gently. One secret, when you ask me about the daily routines and such, I don’t like to create very stiff daily routines, because the freedom that I have within one week is the freedom that my creative side can take. My leadership part plans, makes bigger plans and shows the direction, but gives freedom for creativity, to solve that problems in a way that feels good on that day. That’s one secret for productivity, is that if I don’t feel like editing videos today, I know I can postpone it for tomorrow, and do something else. It’s actually surprising how some things that sound really, are really boring, are really motivating to do if you’re a bit tired or something, you know? Paivi Eerola: Often, it’s just being gentle towards yourself. LeAura Alderson: That makes sense. Yes. Devani Alderson: Speaking of the podcasts, do you have any favorites that you care to share, that inspire you? Paivi Eerola: Yeah. I actually have a couple of favorites. One is Tara Gentile’s Profit Power and Pursuit. I love that because Tara is so easy to listen to. She’s so fluent, and also she asks questions that are really interesting. I think she’s also a really good interviewer, not only a good business coach. I also like CreativeLive in general. I think it has played an important role within those nine months when I was planning to leave my day job. I watched CreativeLive almost every evening. It’s a bit pathetic. LeAura Alderson: No. It’s wonderful. Paivi Eerola: You can watch business courses for free there if you just stay, when they run on air, so that’s what’s really important. Because I live in Finland, the courses start at 7:00 in the evening, so it was quite handy. LeAura Alderson: Fantastic Week? Fantastic Weekly? Paivi Eerola: Yeah. I like to listen to that when I create art, when I paint. That kind of builds the gap with being business and creating in an inspiring way. I especially like that because I’m not a pure fantasy artist. I really get inspired by that, because often I get more inspiration from things that are not directly related to me. That I have to work in my brain. “Oh, that one said like that? How can I translate that to my art, or to my business?” I often find the inspiration, more inspirational, those things that come out of the field that I’m currently working in. Devani Alderson: That’s so important. That’s such a good point for just creativity in general, for the creative side, for the business side, all of it, because so often we get our best ideas when we’re kind of just launched outside of the box that we’re in, and that we generally create in. Sort of like the Steve Jobs calligraphy thing. Who would have thought a calligraphy class would have catalyzed his idea on how phones are used online now? It’s just that concept of going outside to find something. LeAura Alderson: Yeah. It’s in alignment with the universe, as the cow doesn’t drink milk to produce milk. The tree doesn’t grow in leaves to produce leaves and bark. It’s like the way we’re constructed as human beings, we absorb and we assimilate from the universe essentially around us, and our environment, and even beyond. We can be more creative when we go beyond, like you were saying, our immediate environment, and especially the small box that we might occupy on a day in and day out basis. That makes perfect sense. Is there any book that you’re reading now, or that you like to recommend as one that has inspired you as an artist? Paivi Eerola: Well, I’m really bad at reading books nowadays because I have so little time for that. Paivi Eerola: In the evening, when I take the book, I fall asleep almost immediately. LeAura Alderson: Yeah. Me too. Paivi Eerola: But I’m currently reading this book. LeAura Alderson: Bright Earth, by Phillip Ball. Paivi Eerola: -Bright Earth, by Phillip Ball. It’s about color, chemistry, science, and art history, and how artists have used pigments and color through the ages. It’s very inspiring. I’m reading it in small portions, because I feel like that when I read a small paragraph, I have so many new ideas. Paivi Eerola: But in general, I would say that I don’t have any books that have been so important to me, but I would recommend CreativeLive, because that’s one thing that if you think about that you want to build business from your creative thing, then watching a couple of classes there don’t do any harm. Paivi Eerola: If you don’t have the persistence to watch any of those classes, then you probably don’t have the persistence to do the job. LeAura Alderson: Yeah. Right on. Yeah. LeAura Alderson: Yeah. That’s a great point. LeAura Alderson: Nice. Very nice. Paivi Eerola: That’s what I found even more interesting than the teaching. LeAura Alderson: Right. Fantastic. Yeah. We love CreativeLive, Chase Jarvis, and we listen to lots of podcasts as well, so we will look forward to tuning into Tara’s as a new one for us. We’ve already taken more of your time than we said we were going to, because it’s been so much fun learning more about you and your business. Before we ask you the last question, I did just want to come back to you mentioned your husband, and how wonderful it is to have a symbiotic team where your strengths support each other, and they’re different strengths. I saw his incredible woodwork, where he created wonderful tools for you to use in your art, from a storage thing for your paintbrushes, to a resting place for your paintbrushes, to a box for holding your paints and things, so that’s really sweet. He’s quite the artist himself, then. Paivi Eerola: Yeah, he is. Yeah. Yeah. He’s an engineer too, but he understands a lot about visuals nowadays. He has had a teacher. Paivi Eerola: He’s [inaudible 00:55:51] together. Yeah. Devani Alderson: Yeah. Well, in closing we’re obviously going to link all your sites, your website and everything that people should definitely check out, but in closing, do you have any parting advice for the audience? Paivi Eerola: Yeah. I think that for those who dream about having their dream job in art, I think that for those, if I could have one advice, it would be about being generous. That when you think about sharing, the first thing you think that, “Can I do that?” And then the next thing you think is, “Do I give too much away for free?” I don’t really think that there should be such a strict boundary in that. I think that if you’re generous, and if you try to do your best to make your work so that it benefits other people, then you are bound to succeed. That’s kind of moving the focus from yourself to others, but in an empowering way, if you understand what I mean. Paivi Eerola: It’s not about stalking, but, “Did somebody else like me?” Or, “What did somebody else say about me?” Or things like that, but more about, “What can I do for other people, and how can I make my work better so that other people can benefit more of it?” Of course, you have to also get your income and take care of that, but if you’re starting, then actually there might not be much that you have that you can’t really sell, that what you know so far is something that you have to build more, develop more. When you do that development with other people, then it will be successful. When you observe the reactions from other people, or when you ask questions from other people, or when you grow true value to other people, then you will find out where they really want you to be, and what do they want to get from you. Then if you are further away in your path, if you’re already supporting yourself, or if you’re almost supporting yourself, one thing that I would recommend is to have a “How to Fascinate” test. I think that you can get it for free in HowtoFascinate.com. That’s the test that really changed the way I looked at myself, the result, because it’s not your basic psychologic test. It’s a test about what fascinates others in you. LeAura Alderson: Is this the Sally Hogshead? LeAura Alderson: How to Fascinate. Yes. Paivi Eerola: Yeah. Yeah. That was groundbreaking to me, that I realized that all the things that were actually negative sides in me when I was in my day job were actually the things that are positive in me when I work as an entrepreneur. Paivi Eerola: That was a big mind-shift, that all the things that I thought, that I shouldn’t have talked so much, and that I should not be so dramatic, and things like that, that when I got the results from How to Fascinate test, they listed all those as things that I should do more. LeAura Alderson: Yeah. Interesting. Interesting. Paivi Eerola: That was groundbreaking to me. Paivi Eerola: That there was somebody, even if it was only a kind of report, that kind of gave acceptance to the genuine part of myself, and that was a really big thing. [crosstalk 01:01:00]. LeAura Alderson: I’m sorry. Can you … Sorry to interrupt. That gave acceptance to the what part of yourself? Paivi Eerola: Maybe the part of myself that I had to try to hide all the time, because I thought that that’s not appropriate. LeAura Alderson: That’s okay. That’s okay. We’ll just … You know, and the transcript doesn’t catch it. Paivi Eerola: But my test result, it was avant garde, and that was not at all … Something that I hadn’t thought about at all, and that’s about combining prestige and quality with innovation. LeAura Alderson: Yeah. That’s what you’ve done. Paivi Eerola: I felt that always when I worked in my day job. I was too quality-oriented. Now the test said that I should focus on the quality, and that was really a big relief to me. Another thing was that I was always generating new ideas before other people had time to react. Now I was finally free to put all those ideas into reality. I was really liberated by that test, so I’m so grateful I want to mention it here. LeAura Alderson: Yeah. I’m glad you did that. It gave you permission to be yourself, and then you created the environment in which you thrive. You build the environment that you belong in, and that’s what our goal is, basically what we need to do. And if we’re not thriving where we are, then chances are our strengths are not a match for that environment and we need to create or find the environment that is. That’s wonderful. Paivi Eerola: Yeah. Exactly. Yeah. LeAura Alderson: This has been so fun getting to meet you, Paivi. Thank you so much for taking your time and sharing your story. We look forward to sharing this with our audience. We’ll be launching the podcast in November, and we’ll let you know when it airs. Paivi Eerola: Thank you. Thank you so much. Paivi Eerola: It was so good to talk to you. It was so much fun. LeAura Alderson: Same here. Thank you. Devani Alderson: Thank you. Bye.